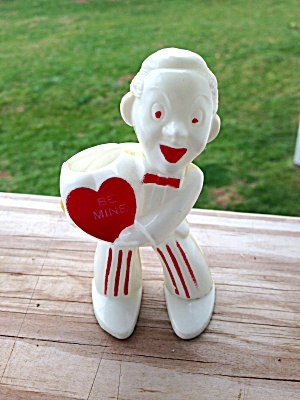 Cute Vintage Valentine Day's piece. He measures about 3 1/2" in height. Suppose to be holding a bouquet of flowers and says BE MINE. Opening at the top for the flowers. Overall condition of this plastic piece is very good. Guessing it's 1940's to 50's era. Great, early gift for the upcoming special day! Free shipping within the U.S.